I often wonder how long can one get nostalgic over and over the same bit that happened some time ago in our lives. Won't the nostalgia stop? Will one nostalgia replace another? Will we stop getting nostalgic after we have exhausted the emotion so much like the cassette that finally wears out due to overuse. This is a fairly recent happening and I find it pretty amusing. I think about a beautiful memory and find that I keep returning to it every single day and by the time I've thought about it for some time now that I feel tired to think of it anymore. Succeeding that 'boring nostalgia' phase is an aversion to that memory. It is then I realise that overdoing nostalgia also gets boring. But isn't nostalgia something sweet and beautiful. Maybe when it strikes once a while to refresh the bygone years and moments but feelings of longing that strike very often lose their appeal over time. 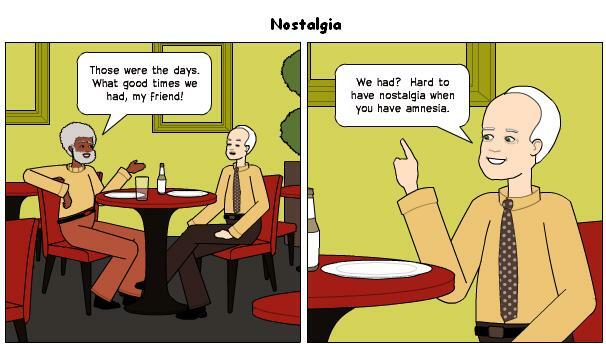 Well, the etymology of nostalgia is from the word, 'nostos' meaning homecoming. Now, I guess that during the time the word was coined, it was meant for someone who was away from home and was longing for home - the physical home and the emotional security that is often associated with the home. But now the word has evolved and comes to mean memory and longing for something that was once part of our lives, not necessarily the home itself. That's what I love about words - they evolve, wrapping in the mood and the times and mould according to the context. They change but still retain their spirit. Coming back to nostalgia, I wonder how long will something remain so precious and lovely that each time we are filled with yearning, we feel nostalgia. I guess even nostalgia changes, rather it evolves to something else before going through a few steps: Initially the memory is beautiful and comes to our mind when we yearn for the past. Then we start clinging so much to that specific memory that nostalgia becomes the norm each day. Finally we are done looking at that memory from a trillion angles that we have explored every fine fabric of that particular memory. Then we break forth and no longer relish that memory. The nostalgia of that memory gets boring and we don't feel like returning to that for quite some time. Perhaps after a long time, the cycle will begin again. Dear reader what do you have to say on this? Yes, it's great but it's overdone in some quarters. Maybe it's the age where one always indulges in the past. A good take on the subject. Never really thought how long we would continue to be nostalgic about something. Nostalgia, in little bits, is good. It helps us to retain our confidence and might even inspire us. But overdose of nostalgia is not good because it might come between us the productive work that we do. You're right like most of the times. A little bit of everything is good. And yes, it does hamper the productivity by giving a false sense of dissatisfaction. No Rahul, I seriously get bored of it sometimes when I go on and on in my mind. You're very kind, Kirthi and how nice it is to see you here after a long long time. HEY, Susan Deborah. I think "noastalgia is GREAT..it beats neurolgia! If it were not for nostalgia, my story would always remain the same. Also, with nostalgia, I can eventually construct a history which makes me look pretty good. If it beats something but boredom, then I guess it's fine dear Steve. If you rarely look back, then you're a model human being whom I would like to emulate. Good for you. Life is good, then. Irritation - A big YES. I'm learning to stop that bug. "- they evolve, wrapping in the mood " it sounds so delicious Deborah .... I just went yum at that.. I know.. keep going back to a certain memory for a certain instance.. and then I wonder, I only have just this one for this particular one, time to make new ones.. Delicious! Words are so not the meaning! Glad that you came today. I don't like to idealize the past. There are some memories, though, that make me happy when I think of, like my wedding, my daughter's birth etc. I don't dwell on them, they just come around every so often. There's no yearning because life has proceeded and now I have many more memories in my repertoire of nostalgia. But if nostalgia has the potential to become boring, I guess we need to relish the moments as they are happening and then let go. Relishing and savouring the present - there's nothing like that and letting go is an art. And if I cannot do anything about it, then NOTHING must be God's Will for me at this time? Sorry, just realized, I double-dipped! Hey, please delete that "sorry" word, HAHAHA! Useful time-pass sometimes becomes a bit too much if we don't pay attention. Glad that you stopped by today. Welcome to the Meanderings. Interesting take on nostalgia, Mrs Sus. I've always associated it with things warm and fluffy. I think nostalgia is as much of the past as it is of the present. Our memories are colored by our present, whether we like it or not. As our present changes, so does nostalgia. So what's my point? I don't know...I got lost in my own nostalgia, haha! My recent post is dedicated to this comment by you. Loved the wee anecdote of the mother and son discussing me. Makes me happy. Hmmm...nostalgia is a sweet word nah--like you have good and positive memories and that you contrast it with today. There is an ache, a longing, and also an anchor to feel good today. I guess it serves a purpose. But it also reveals our discomfort and inability to settle in the moment. Can we just judge it and say--"off you go nostalgia!" as a medicine for this inability? I think not We reach that maturity in due course to let go. But yes, a bit of prodding helps--like this post does for me as I often look fondly at my days in NM and always rush back there when things are hard here. Lovely to see you here today, dear Bhavana. It is an ache, you are right about that. For me, it gets a bit overdone and hence this post. I wish I could shrug off. I too love words and how they evolve over time! I loved the bit of history you gave about the word! Yes, I too get a bit sick and tired of going over memories of the same incident again and again, or worse, of wanting to go back to 'that time'! I'm very happy with the place and time that I am now in! You are like me, I reckon. I love words as well. And the present is what matters. Thanks for dropping by, dear Roshni. Nostalgia is nothing but memories, and memories keep us going. Don't judge a person by the book he/she carries!